Love riding your bicycle in the summer? We do, too! 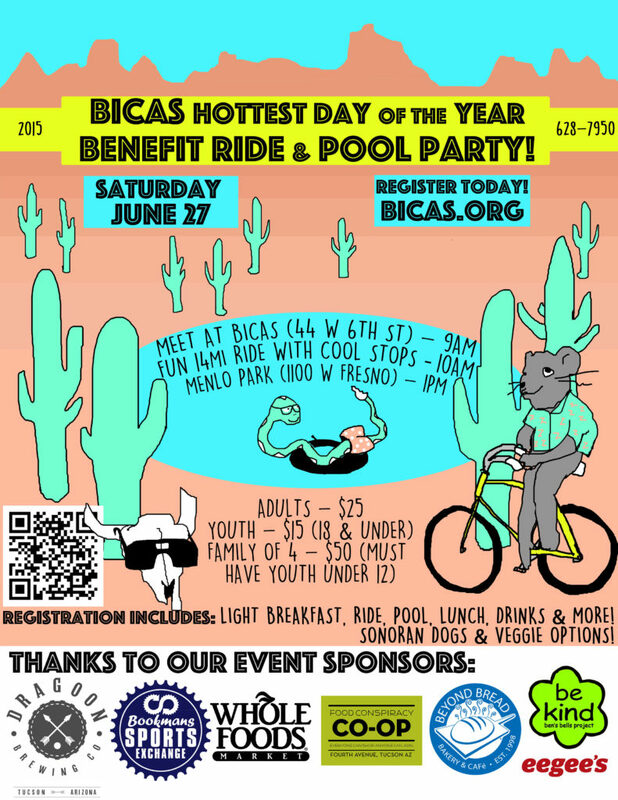 Gather up some friends and join BICAS for our 2nd annual HOTTEST DAY of the YEAR Benefit Ride and Pool Party. This is an easy-paced group ride with fun stops to cool down. It ends at Menlo Park for lunch, suds, and a dip in the pool. Heaps of fun for the whole family! Registration fee includes a BICAS water bottle, light breakfast/coffee, lunch, ice-cold drinks, and pool entry. If you prefer not to ride, just register & let us know (bicas@bicas.org) and meet us at the park to enjoy food, drinks, swimming, and merriment with the rest of your sweaty BICAS friends! 10am – 1pm: Bike ride & fun stops!